Through the power of gravity alone, the body's most symbolic organ "beats" inside a clear glass bottle. Physics and poetry meet in sculptor/inventor Philippe Bouveret's striking, original work of kinetic art, a fountain with a heart that "beats" almost like a real one. With clever engineering and a visionary art sense, Bouveret has created a simple visual metaphor for life and love. 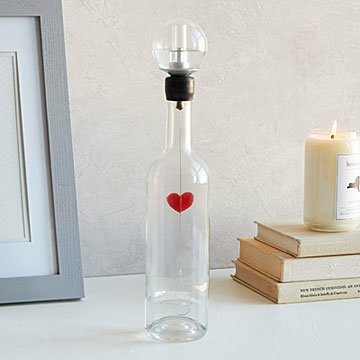 Inside the glass bottle, drops of water flow down at regular intervals, pulling together the two halves of the heart connected by a metal wire. Romantic, moving, a bit uncanny, and even a little playful, the Heart in a Bottle sculpture expresses something we all share: hearts beating for someone.. something... somewhere. Please note distilled water is not included and the heart may skip a few beats before getting going. Learn more about the maker behind this most uncommon curiosity in an interview with Philippe on our blog. Philippe Bouveret welcomes accidents. It’s how he makes the little discoveries that often turn into the physics-meets-poetry sculptures for which he’s known. Born just south of Paris, Philippe has always been fascinated by inventions. As a child, he was captivated by electricity and the telephone, and, after building a six-meter boat, thought about becoming a naval architect. When he discovered contemporary art, however, he traded sails and sculls for sculpture. Under his mentor, Belgian sculptor Pol Bury, he began by focusing on creating movement in his pieces, later adding an element of water. The two features have since become constants in his work, along with atmospheric pressure, heat, expansion, and evaporation. Together, they breathe life into his sculptures, which prove that there is indeed beauty in science. Learn more about this maker of uncommon curiosities in an interview with Philippe on our blog. If you must replace water, use distilled or demineralized water only. Keep bottle away from direct sunlight as well as areas that experience severe changes in temperature.